A section of the crowd at the potluck picnic-style breaking of fast event at Sibu Town Square Phase 1. 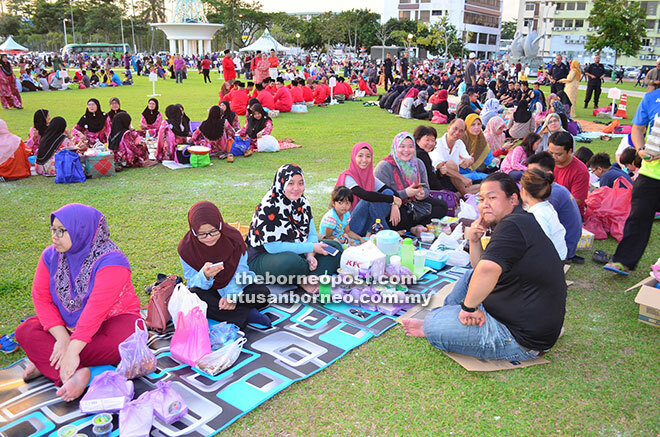 SIBU: Some 6,000 people from different backgrounds congregated here for a mass breaking of fast on Saturday, creating a harmonious atmosphere which was seen as a precursor for similar arrangement for other festivities. Leaders here were united in the hope that festivities such as Chinese New Year and Gawai Dayak, among others, be organised in such magnitude to further strengthen racial and religious harmony. Assistant Minister of Education and Technological Research Dr Annuar Rapaee for one, said the historic feat has again put Sibu on the map, setting a fine example to the entire nation. “I am truly glad that we in Sibu started all this and this helps put Sibu on the map. This is indeed wonderful and a lot of people were saying this (the mass breaking of fast) was the first ever in the state. “But I think (it is first) in the whole nation that we have this ‘Berbuka Puasa’ together with Muslim and non-Muslim in an open field (Sibu Town Square Phase 1) like this. “The atmosphere was very harmonious and this shows the strong unity among the people of Sarawak. We have so many festivals particularly, religious functions, I think they should as much as possible try to emulate this fine example,” he added. Dr Annuar, who is also Assistant Minister of Housing and Public Health, believed the mass breaking of fast programme should be done yearly. “I am sure we will do it on a bigger scale next year and we are going to plan it better as well as involve more people to be at the site of the breaking of fast,” the Nangka assemblyman added. He was also happy to note the organisers achieved the target of gathering some 6,000 people for the potluck picnic-style breaking of fast. “Although the Muslim community here is small, we are trying as much as possible to be united with all other races in the town,” he told reporters when met at the function on Saturday. The event was organised by Nangka Service Centre together with Sibu division’s permanent committee for Muslim festivities under the Resident’s Office here. A total of 170 contingents representing schools, non-governmental organisations (NGOs), mosques, churches, temples, Peryatim Sibu, government departments and statutory bodies turned up to break fast together. Meanwhile, Sibu Municipal Council (SMC) chairman Datuk Tiong Thai King echoed Dr Annuar’s view and suggested that other organisers take the cue from the mass breaking of fast event to organise festivals on such magnitude. “This is fantastic and we should encourage this kind of arrangement for other festivities like Hari Gawai Dayak and the (Chinese) Lunar New Year. I think Sibu Town Square is the best place to organise such events,” Tiong, who is also Dudong assemblyman, said. Sibu Resident Hii Chang Kee described the event as very meaningful to instil better understanding between Muslims and non-Muslims. “This is the first time we have this in Sibu, where we expected a crowd of between 4,000 and 6,000 people. “Together with the Ramadan Bazaar (Sibu Town Square Phase 2) and Sibu Street Art (Sibu Town Square Phase 1) events, this revs up the festive mood at the town square,” he added. Hii thanked Dr Annuar for his leadership in introducing such an event and hoped that it can be continued. Earlier, he noted that the army, Sarawak United National Youth Organisation (Saberkas) and other NGOs helped to distribute ‘bubur lambuk’ and ‘bubur pedas’ to the public. “Many may not know what ‘bubur lambuk’ is but through this, we improve the understanding between various races and religions,” Hii pointed out. The programme started at 5pm with performances such as Nasyid and Qasidah. Around 6pm, there was a short talk by state Islamic Affairs department (Jais) Sibu, followed by a Quran recital. There was also a space prepared for Maghrib prayers on site. Among those present were Temenggong Datuk Wan Hamid Edruce, and Sibu police chief ACP Saiful Bahri.